F. Lee Bailey is an American attorney said to be the greatest criminal defence lawyer of all time. He defended Patty Hearst, the Boston Strangler and Dr. Sam Sheppard and his famous cross-examination of detective Mark Fuhrman is considered by many to be the key to O. J. Simpson’s acquittal. Bailey has the Sun in Gemini which seems appropriate for someone whose career was based on his verbal skills. The Sun is also in square to Mars and his aggressive courtroom manner was legendary. Mars is conjunct Jupiter, however which allowed this approach to bring him great success. The Sun is in the 2nd house of money which is by far the most common house position scoring nearly 50% above the expected figure in the Capricorn Research collection of 359 charts of lawyers. It could be that as most of these lawyers are American, they are all quite wealthy. Bailey’s Moon is in Capricorn at the very top of the chart closely conjunct the Midheaven. When an important planet is conjunct the Midheaven, it shows strong themes around the conduct of a person’s career and will often propel someone to the very top in their chosen area. Capricorn has good organisational skills and a natural understanding of authority structures such as the law. The Moon in this sign is emotionally very controlled and pragmatic, perhaps it was this facility that enabled Bailey to successfully defend some of his more notorious clients. The Moon is part of a T square including an opposition to Pluto which focuses onto Uranus in the 1st house. This adds an intensity and wilful quality to Bailey’s character and the willingness to defy convention. This aspect pattern does also suggest an extremely sudden fall from grace. Bailey’s big breakthrough came in the case of Dr. Sam Sheppard who was found guilty in the murder of his wife Marilyn. Bailey was hired for Sheppard’s appeal and in 1966 he successfully argued before the U.S. Supreme Court that Sheppard had been denied due process, winning a re-trial. A not-guilty verdict followed. This case established Bailey’s reputation as a skilled defence attorney and was the first of many high-profile cases. 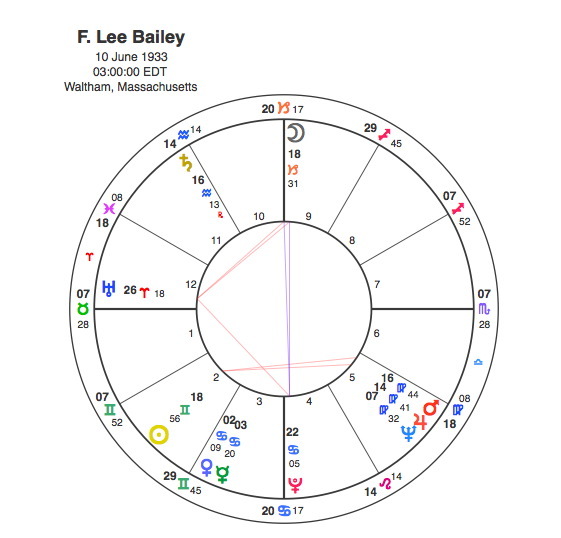 Pluto was conjunct Bailey’s Mars and square his Sun in 1966. This was the start of an illustrious career, the next time Pluto aspected the Sun and Mars would effectively mark the end of it. The State Supreme Court of Florida barred him from practice in 2001 for the manner in which he handled the disputed 1994 drug smuggling case and in 2003, the Massachusetts Supreme Judicial Court agreed with the Florida ruling to disbar him for having misused stock belonging to a former client. This meant he could no longer practice in federal courts. Pluto was opposite Bailey’s 2nd house Sun and square his Mars and Jupiter from 2001 – 3. As with so many others Pluto brought F. Lee Bailey to public prominence but also took it away again.